My highlight of the 2014 March Madness Tournament was the Arizona Wildcat win over the San Diego State Aztecs in the Sweet 16. What a great game. It was, however, a bittersweet win for me because, although I used to play for the U of A and the school is in Tucson, the town in which I made my debut as a homosapien, the Aztecs are my team too as San Diego is the town I came to when I decided that my “running around looking for shade trees” days were through. So my rejoicing after the game was somewhat tame. But I did do a little jig. For about an hour. But no matter who ended up as the victor it would have been a win-win situation for me in that I absolutely love both teams and SDSU had an opportunity to reach the field of eight teams for the first time. That would have been wonderful for them. But It’s going to happen someday at some time. I like that their coach feels the same way and tells his guys so. Such stated beliefs would be music to an athlete’s ear. It’s how hopes are inspired, especially when the notion is realistic as it is with the boys from Montezuma Mesa. Speaking of hopes, those of the Wildcats and mine went down the drain as they went on to lose in the Elite 8, a round in which they’ve played a few times, ending their dream of winning the whole thing again. But what a team. Of all the Arizona squads I’ve seen, going back to the 40’s – and there have been some great ones out there in the high desert – they’re my all-time favorites. Seeing them cutting it up on the basketball floor has been something wonderful to watch. They can flat-out play. If they couldn’t there’s no way they would have beaten my team from the other city by the bay. So many gifted players on each team, fierce competitors with heart “who,” as we used to say, “can jump out the gym.” They crash the boards, dive on the floor for loose balls, and break out with all kinds of smooth unbelievable athletic moves. They, seemingly, are totally committed to paying the dues required to hone skills they can use to win games for the red and black and the red and blue. And how refreshingly unselfish these basketball playing Wildcats and Aztecs appear to be, apparently not caring who gets the most words written about them in the news. With the season now at an end I’m already thinking about next year as both teams will have major players joining their ranks with San Diego State boasting one of the top recruiting classes in the nation. These dudes will be raring to go. 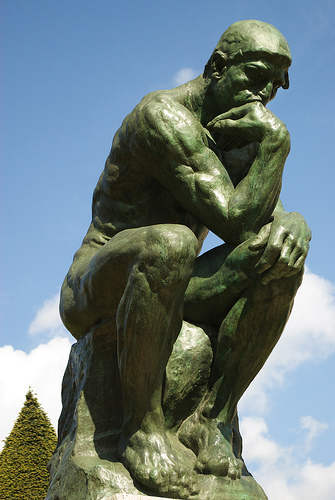 And, in my excitement, I’m like “The thinker” with my mind settling in on ideas such as what it would be like if we folks in these two cities got as turned on about other aspects of our lives as we are when we’re burning with basketball fever. I’m thinking that the sky would be the limit for achieving wonderful things. I mean we obviously appreciate excellence when we see it and we’re witnessing coaches who know how to motivate young men who want to become the best they can be as athletes and as, more importantly, human beings. They know how to relate to their players, how to listen, how to engender confidence and get them to strive for being great, not just good. They never go off message. So couldn’t mayors and councilpersons and the like be equally as progressive in their thinking, in their way of meeting the needs of all its citizens? Couldn’t they learn something from these wonderful coaches about taking on the challenges cities face since every game is a challenge to a sport’s team, since there’s always some level of overcoming to be done and persistence to be maintained and kinks to work out as the season goes along and situations change from game to game? Couldn’t they learn something about how to realistically set relevant goals and learn to deal with emergencies like teams have to do constantly? Couldn’t they learn to bring people together, despite their ethnic or political or social differences, on the same page to make life better for all concerned, like coaches have to do with players coming from near and far from all walks of life with different skill sets that need to be blended into the making of a unit that works together? Couldn’t “We the People” accept nothing less from our representatives? Oh, well, I’m only wondering. It’s not a strain of March Madness or anything. It’s just that I get like that when thoughts of a better world enter my mind. It’s “The Thinker” in me.